Walter Gropius was educated at the Friedrichs-Gymnasium and at the Bauakademie in Berlin. He participated in the Franco-Prussian War of 1870-1871 as a volunteer. Afterwards he worked as a building inspector in Berlin. In 1898 he became building advisor for the Police Headquarters in Berlin. He married Manon Auguste Pauline Scharnweber (1855-1933). Their third son was the famous Bauhaus architect with the same name. The grave of Walter Gropius the Elder was moved to Stahnsdorf because of the clearing of cemeteries in Berlin by the nazis to make way for the new 'Germania' that was never built. 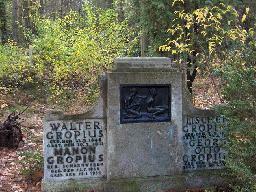 The grave of Walter Gropius at the Südwestfriedhof, Stahnsdorf, Berlin.